Officials are worried residents and commuters won't take the Ice Storm Warning as seriously as they should, simply because they think it's another snowstorm. 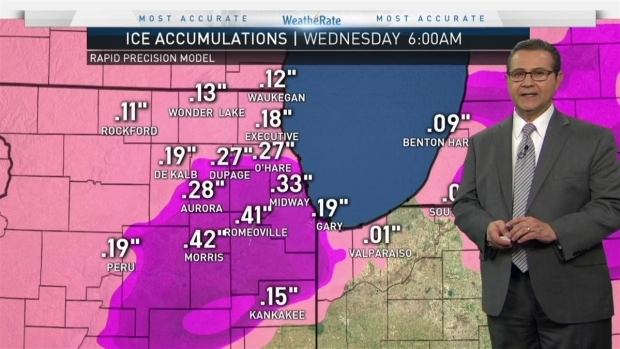 Ahead of an Ice Storm Warning set for the Chicago area Tuesday evening into Wednesday morning, FEMA officials say the threat of power outages could be worse than a blizzard. NBC 5's Chris Hush reports. As the the Chicago area deals with the effects of an Ice Storm Warning through Wednesday morning, FEMA officials say the threat of power outages could be worse than a blizzard. "The biggest risk right now is definitely going to be, if you’re on the road, untreated roadways, untreated sidewalks if you’re walking. They’re going to be the most dangerous," Joseph said. "Parking lots, when you’re going to and from your car." Joseph said these road conditions could be treacherous and urged people to go home and avoid the roads before the warning starts. "We’re really looking at the rush hour being greatly impacted," he said. Downed power lines and trees are another threat as ice builds. In some ways, ice can be worse than snow, Joseph said. Ice accumulation can increase the weight of a span of power lines by up to 500 pounds and the weight of just one tree branch by 30 times, according to the National Weather Service. By Tuesday afternoon, ComEd had more than 500 crews on standby for restoration efforts. "When we have ice form, especially to that thickness, the ice can cause tree branches to fall and that could come in to power lines," he said. FEMA is working with local and state officials, on standby and ready for any assistance needed. During a significant icing weather event, any outdoor surface that isn't treated, such as roads, parking lots and sidewalks, will be covered in ice. Even trees could become covered in ice, bringing a risk of limbs breaking under the weight of ice. Public transportation could face issues with potential ice accumulating on train tracks, and buses facing ice on the roadway. On the other hand, ComEd urged residents to never approach a downed power line and "always assume a power line is energized and extremely dangerous." "Preparedness in advance is the key to people being safe and people being able to respond to it," Joseph said.